We’ve been living in our house for six months now. It’s actually quite terrifying that we’ve been here so long, especially when I glance around at all the unfinished jobs around the house. This house wasn’t a huge project when we bought it, but it was unloved and very magnolia. It is still very magnolia, which is at least partly down to a total lack of free time. Where are you meant to fit DIY in amongst so much working and a need for family time?! Our problem is that even when we do decide to sort out a room, it takes us ages to get everything finished. Our kitchen still needs another coat of paint and some other odd bits to finish it off. 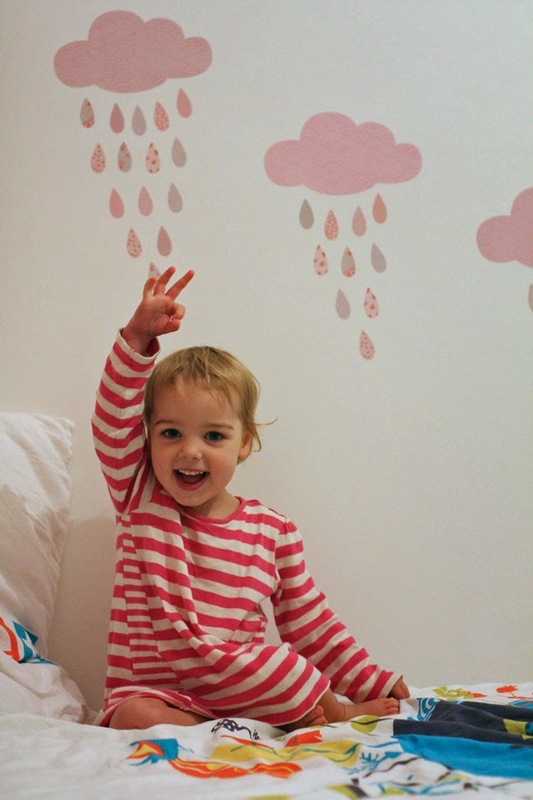 When the lovely people at Koko Kids offered me some wall stickers to review, it seemed like the perfect opportunity to sort out Ebony’s bedroom. I love the idea of wall stickers, but I’ve never really seen any that I love. They never look like quite the right fit for my home, they’re either too big or just not my style at all. When I had a glance through the selection at Koko Kids, I was very pleased to discover that this was not the case. They had a great selection, and there were quite a few designs that caught my eye. I really loved the bunnies stickers, but in the end opted for this gorgeous cloud design. My mum came over to help paint Ebony’s bedroom, and after a couple of days of having paint on my eyelashes (does this happen to other people? ), it was finished. I finally moved everything back into her now-very-white room this afternoon, and decided to put the wall stickers up above her bed. The sticker sheet is reusable, allowing you to store the stickers again if you wish. This came in useful for me because I decided not to use all of the raindrops in the pack, so I’ve been able to store the rest in a cupboard. One of the things I love about these wall stickers is that you have artistic control over them. It’s not one huge sticker, it’s lots of little ones so you can decide how to arrange them. The stickers are fabric, textured and easy to use. I love the different patterns on the raindrops. It took me a while to decide exactly where I wanted mine, and I found they unpeeled easily and hadn’t left any residue on the newly painted walls. I absolutely love how they turned out, I think they add a little something to Ebony’s room, and look really stylish. Ebony thinks they are very pretty, but said she wishes she had an umbrella in bed now. So, it might be worth buying an umbrella too if you’re thinking of choosing some of these for your child’s room. 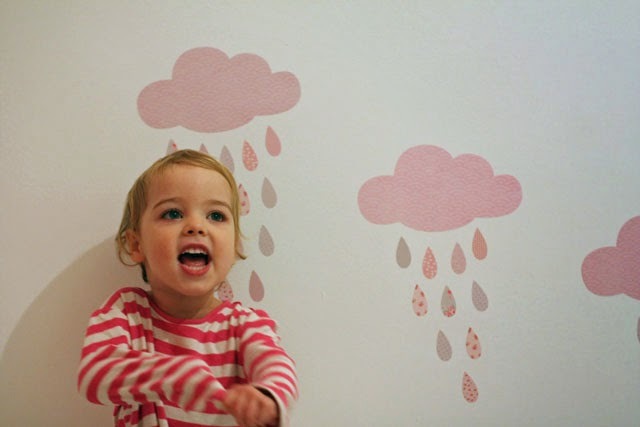 You can buy the three cloud wall sticker from Koko Kids for just £19.95, they’re available in pink and blue. Or, have a browse at the other stickers in their collection. I was sent these wall stickers to review honestly, and I did.